After looking at several options, including GStreamer and Ffmpeg, there was no easy solution in sight. And then I took a look at Videolan, also known as VLC. Here's how I got to a working solution. Note however this is a quick hack. In this dialog, check that the correct device is opened (I open /dev/video0), and things should work as expected: when you click "OK", you see the images captured by your webcam. check "File", as this will save the stream coming from the webcam into the filename you enter in the textbox. 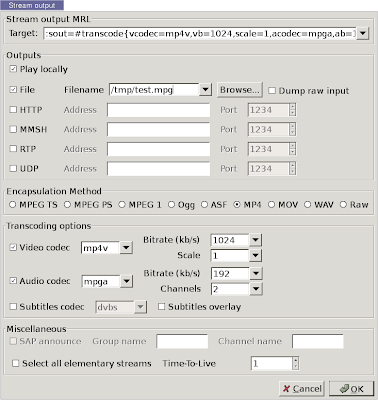 choose MP4 as "Encapsulated Method". You need to choose this carefully as not all encapsulation methods accept all format. 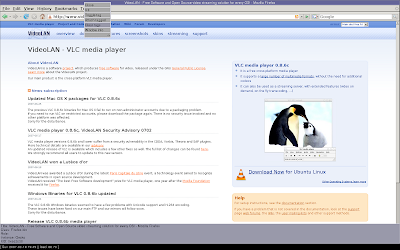 Check the VLC streaming features page for more info. According to the Encapsulation Method you have chosen, choose the right video and audio codec. For MP4 it's respectively mp4v and mpga. If you only want to dump the video, only the video checkbox has to be ticked. Clicking ok in each dialog will show you the stream in VLC's window, and dump it in the file you entered in the configuration dialog. which contain all configuration option set in the dialog. These configuration strings can be used on the command line when launching vlc. Each v4l corresponds to a long option passed to vlc. :v4l-vdev="/dev/video0" becomes --v4l-vdev /dev/video0 on the command line. The next step is to start and stop the recording from a script. This is possible thanks to the RC interface offered by vlc. the RC interface, launched by passing the option -I RC to vlc, gives you a command prompt to control VLC. With the option "--rc-host localhost:4444", this command interface is even reachable by telnet on port 4444.
add v4l:// to start the recording. It opens the v4l device passed in the options of the command line, and outputs the stream to what we configured on the command line as well: the file and the screen. I've had problem sometimes for the options to be taken into account. Going through the vlc extended GUI and enabling the image adjustements usually fixed it. Building a little interface on this is quite straight-forward. I used Ruby and Tk. The GUI is made of.... 1 button used to start and stop the recording. It is triggered by pressing the "Enter" key. The control GUI also shows how long, in seconds, the person still has before reaching the maximum lenght of the recording. The script starts VLC with the RC interface and the telnet connections accepted on port 4444. All commands are passed to VLC through the telnet connection. VLC always stores the dumped stream in the same location, and at the end of the recording session, the script moves it over to a definitive location, with a unique name based on the timestamp. The problem with this setup in a "standard" window manager, is that recording starts, a window is opened to display the image coming in from the camera. this window covers the command unterface, which makes it impossible for the user to simply press on Enter to stop the recording, and the focus is on the vlc output window. For Ion 3 users, there a quick solution here: split your workspace in two, and make the GUI appear in the left frame, and the vlc output window in the right. What's even cooler is that when the vlc output window is opened when the user starts the recording, the focus stays with the command GUI. I will assume that you have installed Ion3, and copied the standard config files to ~/.ion3, as explained in the Ion3 documentation. and at log in I choose the "Default" window manager. When you log in, you get a workspace with one frame. To split it vertically, use Meta+K S. You can bind the key you want to Meta in ~/.ion3/cfg_ion.lua. I set it to Meta4, which is the Windows key on my laptop. and press "Enter". You are then promted for a name. Give the name app to the left frame, and vlc to the right one. Ion automatically saves your workspaces when you log out. As the app is running under a specific user, this will not have to be repeated. Once you have this info, you can configure the GUI window to appear in the left frame. to start the webcamrecorder immediately when logging in. Note that I first wanted to place this in the .xsession file, but it didn't work. Apparently, webcamrecorder.rb has to be started from a terminal, or it won't work. I suspect this is due to the RC interface we request from vlc. Once you have your solution up, you can clean your Ion bindings to avoid users switching frames, creating workspaces or starting terminals. I also cleaned up cfg_ion.lua to limit the number of modules loaded. I end up with these config files: cfg_ion.lua, cfg_ionws.lua, cfg_menu.lua, cfg_query.lua. Together with the webcamrecorder.rb script, it's all what makes up this quick hack. Update: Richard took the script and made a GTK version. He posted it in the comments, together with information on how he's using v4l2. I put the script in a file webcamrecordergtk.rb that you can download. Thanks Richard! Thanks for sharing your work, this could be useful for many others. This is exactly the write up I was looking for (application will be in a carputer to use a webcam for recording autocross runs...I need it to be as simple as possible to operate). Thanks! I can get the webcam to work (and capture) using luvcview with no problem. The thing was that I need to record audio and luvcview doesn't support it. anonymous, are you sure you open the correct device? Yes I'm sure because I use the same device for luvcview. I think linux-uvc has a v4l2 driver. vlc doesn't support v4l2 yet. I forgot...I launch uvcStream so I can use a V4L2 webcam, and that is what I send to VLC so it can capture it. Also, that code probably isn't readable because of the format of this blog commenting system, but copying and pasting it into a text editor should yield more usable code. Thanks Richard! I updated my original post, mentioning your script, and I put it in a downloadable file. You can test and check your webcam it is easy. and you will find they have been talking about this Rebol cross platofrm GUI scripting language. Can you tell how to go for VLC on windows? I have tried the steps but am not able to see the output on VLC. What versions of what distro did this work on? I am trying to set something up very similar but I'm not familiar with ion3. Your VLC menus also look very different and seem to have different options than the modern releases. Do you remember anything else about your system that may point me in the right direction. Thank you for posting your setup, it may have saved me many hours in building my own.